A 25-year-old woman was killed early Monday after she drove the wrong way on Interstate 75 in Pasco County and struck a semi-truck, according to authorities. The Florida Highway Patrol claims the woman was driving northbound in the southbound lanes at 4:35 a.m. when her 2012 Nissan sedan hit a southbound tractor-trailer carrying food and beverage products near St. Joe Road, four miles north of State Road 52 in San Antonio. Officials believe that the woman’s Nissan smashed into the semi and then a concrete barrier. The impact caused the semi to roll over in the crash. Troopers said the semi-truck driver, a 42-year-old Port St. Lucie man, tried to avoid a collision by moving to the outside lane, but was unsuccessful. The Nissan hit the left side of the semi, but the diver was not injured. As the semi came to a halt on the highway, the Nissan traveled to the median and onto the concrete barrier wall. The driver of the Nissan was airlifted to Regional Medical Center Bayonet Point, where she later died. The southbound lanes of I-75 were closed at mile marker 290. One of the southbound I-75 lanes was reopened just before 7:30 a.m. This crash marks the fifth serious wrong-way crash in the Tampa Bay area interstate highway this year, now totaling 11 people being killed. The National Transportation Safety Board released a Highway Special Investigative Report entitled Wrong-Way Driving in December 2012 that focused on wrong-way collisions, mostly addressing incidents that occurred on high-speed divided highways or ramps for controlled-access roadways. The study concluded that wrong-way crashes were relatively infrequent, accounting for only about 3 percent of the accidents on those roads. However, just because these accidents are not the most common, due to the fact that they tend to be head-on accidents, wrong-way crashes are usually more serious and more often fatal than other types of highway accidents. When an injury has major life-long consequences, our Pasco County Auto Accident Lawyers at Whittel & Melton understand just how important it is to recover financial compensation to not only cover the losses already incurred, but future costs as well. With that said, we are very familiar with the sensitivity of both catastrophic injury cases and wrongful death claims. 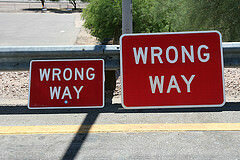 While wrong-way collisions are somewhat rare, these accidents almost always leave behind tragic results. If a wrong-way driver has caused a serious injury for you or has taken someone close to you, please call us today at 727-847-2299 or contact us online for a free consultation. We are here to help you so that you can move forward from this tragedy.